Read some of the great testimonials we've received from our subscribers! Newton, USA - "I always appreciated classical music and your site is something so good I visit it frequently to listen to some of your free and beautiful music (through Classical American Public Media). I'm sorry I'm not a buyer, but I consider your site one of the most useful agent of Culture in the Internet. This is just to thank you for the good times. I really enjoy." Tamar, Israel - "Music became the main interest of my long life. I studied music during a period of four years , after I retired from Molecular Biology Research . Listening to and playing music are now my most important activities and Classical Archives are of great help with their new releases, the different "greats" the exclusive Presentations , playlists and all the rest. 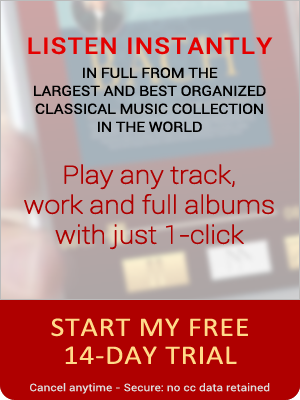 Your organized classical music collections , list of artists , composers and general music overviews help me a lot and I am waiting for your letter every week with joy. Thanks a lot." Regina, USA - "I am a brand new subscriber...in fact I am still in the 2-week trial period but will certainly keep on subscribing after these two weeks. This is an AMAZING website, so well maintained, the tutorials an information are right on and the music selection...oh my!! I expect to give gifts of this website to other classical music lover friends.. Thank you for an outstanding product!!!" Barry, USA - "I just downloaded your iPhones app, and it is terrific. Now I can have a huge virtual jukebox of classical music to access when I am at the gym, when I am working away from my home base, anywhere. Just a great addition to your already wonderful offerings. Call me a subscriber for life!" Ross, USA - "Bi-tchin!!! You ROCK........Iphone APP!!!!!!!!!! Thankyou! Now I can use Classical Archives on my iphone as easily as Spotify but different and better in many ways. So cool.....I wander thru the magnificent world of music. Wow wow wow. I gave up using CA in the car because it was dangerous....but this makes it much safer to use in the car." Izzy, USA - "I received my Bifrost DAC last Friday and have enjoyed it so much I had to write. 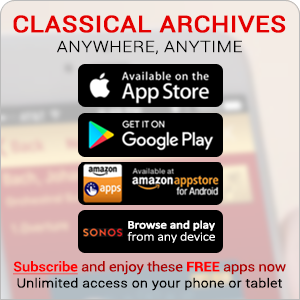 I use a couple of streaming services, classicalarchives.com and mog.com for classical and popular music. I also have a collection of mostly classical music ripped from purchased cd's stored in lossless format in iTunes. I also have several higher def music files downloaded from HDTracks and eClassical.com. My system includes a the NAD 375BEE amplifier and 25 year old Definitive BP10 speakers. It's not a super duper system but I'm happy with it. Until buying the Bifrost DAC I had two other USB-only DAC's from another company, first their entry level product, then a higher level product from the same company. I was pretty happy with how they sounded, but the bass was a bit weak, and I usually used the tone controls on the amplifier to boost the bass, especially for classicalarchives.com, which streams in 160 kbps. For the cd's in iTunes I use the software Pure Music to play the audio files, and I use it's ability to create a core audio set to boost the bass. I always thought the need for more base was a lack in the BP10 speakers, since they don't have a real subwoofer. Wow, was I surprised when I installed the Bifrost DAC!! Suddenly there was plenty of bass, and not only that but the music was much more like real music -- smooth, full, rich. I was really stunned. By the way, I'm using Bifrost's S/PDIF interface to connect my macbook pro to the DAC. I don't have the USB option installed. Now I turn off the amplifier's tone circuit altogether; same goes for Pure Music. I also stopped doing any upsampling which made things sound better in my old DAC. It's not needed anymore. I am very happy listening to cd's at 41100 16 bit using Bifrost. During my tests upsampling didn't seem to improve things. What's most amazing to me is how much better the streaming sounds from classicalarchives. The sound is so much fuller it's a real joy to listen to. Thanks for creating a beautiful sounding and designed piece of equipment. I'm emailing a copy of this letter to the folks at classicalarchives too. I've used their service for years; suddenly it's so much better!" Johan, Belgium - "Your site is really wonderful. It gives me uncountable heavenly moments of listening..."
James, USA - "Dear Classical Archives... Thanks so much for such a bounteous offering. I've hardly begun listening. And, as the saying goes...'I can hardly believe my ears.' Again, thanks so much for this wonderful service. " Vincent, USA - "Subscribing to your website is probably the best investment I've made in years. I have been recommending your website to my musician friends." Sarah, USA - "Hello. I just finished my 14-day free trial period, and I just wanted to let someone know that I absolutely love your website and all the beautiful music it has brought into our house. My children are very interested in the site and have their own playlists, and they're getting exposed to all different types of classical music and learning about the periods. I will definitely be paying for a year's subscription. Thank you so much." Jack, USA - "Thank you for the 1 click concerts in each periond. I love to listen to them. Otherwise, I would not find this music. You make it easy and very enjoyable." Lindsay, Australia - "I have listened to these [newsletter] clips with incredible joy and great surprise. All are most inspiring, moving and instructive, and you have given us one of the most valuable resources to be found anywhere in the world." Byron, USA - "Thanks for offering the "unlimited play" subscription for such a great price. As a part-time music student, I don't have access to university resources for online listening, which are very expensive for individual subscription. Your service makes it possible for me to study all the music I need to learn, right here at home. The sound quality is quite good for an Internet service, the selection of recordings is excellent, and the search and categorization features are the best I've seen online." David, Philippines - "I've just received my first download (Franz Liszt's Les Preludes) and I am very pleased -- excellent value for the low price. The sound quality was very good when I played it. I'll probably be back for more. Thanks for having a great website!!!" William, USA - "I just want to tell you how much I am enjoying this site. You have a wonderfully expansive catalogue and your prices are quite reasonable. A real boon for classical music buffs!" Jeremy, USA - "I love your site. The design and organization of the works of each composer makes it easy to not only listen to anything, but learn about it as well. As a classical pianist myself I've always wanted to better understand what I play, and your site makes that possible for me." Stephen, USA - "I must say that I LOVE the site. The selection and quality of the music is just amazing!" Richard, USA - "I'm very upset that I didn't find your site years ago, as I have paid a lot of money to another site that, supposedly, had great classical music offerings. I absolutely love your site, the way you have put it together, the way I can play complete albums, full symphonies, and hundreds of play lists -- all for an extremely reasonable annual price. The other site I mentioned allows only short excerpts of recordings for me to decide if I wanted to spend the money to buy them, and the price of their subscription exceeds the annual price of your site in less than three months. I teach a classical music appreciation class at a local senior center, and your composer, period, and other briefs and notes are now all I will need to present the class members with wonderful information along with wonderful music. Thank you! Thank you! Thank you! I'm yours forever." Hosni, Saudi Arabia - "Many thanks for everything: the idea, the music, the HD video, and the joy I felt." Marvin and Trish, USA - "My wife and I have been retired for ten ten years and have chose to spend most of that time traveling. We love classical music and have listened to Classical Archives throughout the world, from Myanmar to Micronesia, even in the Trans-Dniester Republic! We have tuned in while staying in rustic abodes, humble hostels, and the occasional proper hotel. Your menus are easy to use, making it possible to listen to any of the thousands of composers and artists in your vast and growing collection. When we set up in a new location the first page we open is Classical Archives." Roger, USA - "Just want to tell you how much i appreciate your service. Great music, speedy website access to a great variety of compositions and performances...fairly priced. You are best in class." John, USA - "The new Queuing Player page is very attractive. Thanks for doing that. What a rich and elegant operation in general; I don't know how I lived without it!" Kel, USA - "Just wanted to tell you...you are the best classical music deal on the internet. When I joined I had limited expectations. How good could a streaming service be. But I have listened to and explored more classical music than I ever dreamed of. Access and quality. I have a really high end system, and run the audio signal through a fairly decent digital-to-analog converter. The results are stunning. It's like having your own cloud, with just about every significant classical music at your command. For under 6 dollars a month. Wow." Tim, UK - "As a user of Spotify premium and eMusic, I'd just like to say what a pleasure it is to use your service. The website is largely devoid of any "flash" clutter and is fast and responsive. The website is streets ahead in terms of functionality. Currently in the trial period, but I will purchase an annual subscription - excellent value for money given the quality of the streams and the price of downloads. Keep up the good work and PLEASE don't go all "corporate" on your users as eMusic has done." Giuseppe, Italy - "I can affirm that ClassicalArchives is absolutely the best website for the Classical Music! Streaming, downloading, info, features ... everything is Top Class!" Steve, USA - "First let me say that your site is far and away the best site for Classical music. Because you seem to cater to the connoisseur I was wondering if you would consider making your music available as WAV files. I would be willing to pay more for the premium and I think a large part of your members would too." Bruce, USA - "Your service has not only been critical to completing my digital transition, it is buy far the most extensive and most user-friendly. Yes I have used Amazon (only for a few items not found in your library). It is inconvenient and not user friendly." Robin, USA - "Your site looks great -- wonderful selection." Enrique, Mexico - "I have used CA since it was Midi archives, more than ten years ago. I am using midis now (for vocaloids), and yours are very good quality. I feel I owe you this subscription and thanks, for all the files I still keep. May also get a an mp3 or two." Michael, USA - "OMG! This is fantastic! It's the Pandora of the classical set." Constantine, Greece - "What can I say. Excellent. I'm a new subscriber and really impressed with the site's interface, ease of navigation and variety of classical works. I have experience with really hostile sites and yours by comparison is an oasis." David, USA - "I've always been a fan of your business model and loved that it's thrived over the years while so many other startups have not. You are so great!" Pancham, Sweden - "Tonight, I felt I just had to hear Le Roi de Lahore, a dusty Massenet opera. I live in Sweden, and we usually listen to our music streaming through a service called Spotify, but they didn't have this recording in their library (which is 95 % the same as eMusic's). Then I tried to buy it on MP3 from Amazon - but they wouldn't let me! Because I live in Sweden! Incredible! So stupid! Well, I found you through further Googling and registered here in a last-ditch attempt. There was not one needless complication along the way and now it's playing on my computer. Thanks for catering to music lovers ALL OVER!" Mario, Brazil - "I am a real fan of your site since I discovered it by chance. I read about it in a newspaper article here in Sao Paulo, Brazil a few years ago and was curious to check it out. I must say I was very impressed with it. I soon became addicted to it ! I discovered many new composers and listened to 'old' ones very methodically (like all 32 Beethoven piano sonatas). As a music lover, I thank you for your amazing work. I will be glad to receive your newsletter." Marinka, USA - "I know it has been years. I'll tell you why I made an account with classical Archives. My auntie loves music I can’t find anywhere else. So I am prepared, in case she will stop living on this planet. She has got severe Parkinson and is older than the doctors thought. Maybe she will be the oldest Parkinson patient there ever was (if you can’t sing or make music, it is an alternative....). But in case I know where to find her music..."
Kahel, USA - "Yes, I would like to be part of your mailing list. ClassicalArchives.com has given me so much pleasure and wonder since I first discovered it online. I hope all is well at your end." Brenda, Hong Kong - "Thank you for the great site 'The Classical Archives'. I think i passed my G8 piano exam because of hearing the exam songs in it. As i remember my first visit maybe earlier than 2004, in my mind, i don't need to enter any personal information the year before, am i rite? Before 2004, we can hear much more songs for free. But anyway, your site is value for money and i would recommend for my friends. Thank you for all of you and the great site." Jaroslav, Czech Rep. - "Dear friends, it was a very pleasant surprise to your mail...... Very, very thanks. Classical Archives is number ONE and I very glad about your collaboration for me. Excuse me please my english..."
Woo Kyou, Korea - "Thanks to your broadcasting! I'm still listening your casting always. Good quality and best choice music!! Thanks again!!" Paul, USA - "I am totally awed by your quality of streaming, and the depth of available music plus background information. Thank you for starting a great site like this for classical music fan. I am going to do a link from my Chinese language site so that friends can come to discover what you have to offer. Thank you, Thank you, Thank you..."
Ugur, TR - "This website is, in my opinion, the greatest compliment for classical music lovers. Even for a free user, to find a free concert right at home every week is a sweet experience. I thank you sincerely for providing this opportunity to me, because of my "unselectivity" or "over-selectivity", I can't get to hear new music that often. These free concerts are a great way to discover new music." John, USA - "What a wonderful magic mountain of New Releases you just sent out; it will keep me out of trouble for weeks! Thank you for being such a non-pareil resource for classical music." Vic, USA - "First of all...This is a GREAT website and I have absolutely no regret paying what I did. My listening pleasure makes up for my financial shortfall!" Chris, Great Britain - "Thank you for the wonderful service you provide on your site. I have a couple of hundred quality classical midi Piano tracks from all of the major composers if you would like them? It would be nice to give Classical Archives something back. If you would like them please provide an email address." Carlos, Portugal - "Just to let you know, that I do enjoy listening to your broadcast, almost daily. Some pieces that are programmed to play, and commonly not heard a lot, make this site some sort of discovery. For instances, hearing the Piano Concerto n 2 Opus 11, by Cesar Franck, makes the day."